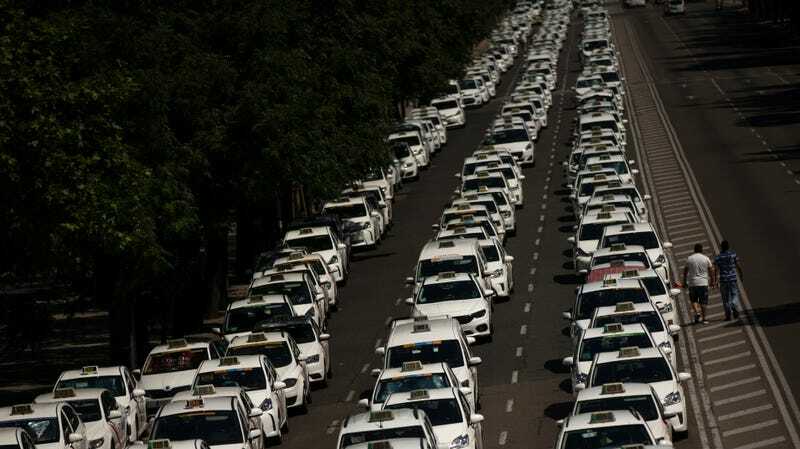 Taxi drivers in Spain are entering the third say of a strike designed to put pressure on the nation’s government to cap the number of licenses issued to ride-hailing services like Uber, reports Reuters. Taxi drivers have ensnared main arteries, bus and train stations, and airports with traffic by simply parking their cabs and not moving. Seriously, take a look at some of these shots. So what sparked the action? Similar to what drivers across the world have said, Uber and other ride-hailing services have made it extremely difficult to earn a decent living anymore. “Uber and Cabify are putting the viability of the taxi sector and 130,000 jobs at risk...nThe union considers this unfair competition intolerable,” the Spanish cab driver’s union said in a statement reported by Reuters. Barcelona officials had passed an ordinance to curb Uber and other services like Cabify, but the provision was temporarily placed on hold by the Spanish court system, “which feels that it encroaches on national powers over transportation issues,” reports El País. So, as of last Wednesday, drivers launched a strike. The drivers’ union met with government officials in a four-hour meeting on Monday, according to El País. The government reportedly offered to extend the authority to grant licenses to regional governments, but the union argued that would expand current problems even more, the news outlet reported. More talks are expected to continue later today, which come at the peak of tourist season in Spain, El País reports. From there, the taxi drivers will continue whether to continue the ongoing strike or not. A spokesperson for Uber didn’t immediately respond to a request for comment. We’ll update the post if we hear back.